Could Moon Miners Use Railguns to Launch Ore into Space? Electromagnetic mass drivers using solar power could provide low-cost transportation of materials to space construction sites. The United States Navy fired a projectile at Mach 6 during a recent test with an electromagnetic railgun, suggesting that early ideas about using such tech to launch payloads from the lunar surface might not be so sci-fi after all. Mach 6 (six times the speed of sound) is 4,567 mph (7,350 km/h). The escape velocity at the moon is just a shade faster than that — 5,300 mph (8,530 km/h). The U.S. Navy's electromagnetic railgun in action during a recent test. Magnetic fields created by high electrical currents accelerate a sliding metal conductor, or armature, between two rails to launch projectiles. 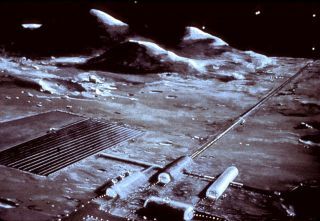 In 1974, Princeton professor and space visionary Gerard O’Neill first proposed using an electromagnetic railgun to lob payloads from the moon. "Mass drivers" based on a coilgun design could be adapted to accelerate a nonmagnetic object, O'Neill suggested. One application he proposed for mass drivers: tossing baseball-size chunks of ore mined from the surface of the moon into space, where they could be used as raw material for building space colonies and solar power satellites. O'Neill worked at the Massachusetts Institute of Technology with Henry H. Kolm and a group of student volunteers to construct a mass driver prototype. Backed by grants from the Space Studies Institute, later prototypes improved on the concept, showing that a mass driver only 520 feet (160 meters) long could launch material off the surface of the moon. An official at the Office of Naval Research, contacted by Inside Outer Space, said this of O'Neill's seminal work on mass drivers: "Very interesting proposal to use electromagnetic launchers for space vehicles. Considering the fact that the railgun is working with a small hypervelocity projectile, and requires significant power and thermal management, I suspect working out the details for movement of larger space vehicles/payloads is a long way off. Deflection plates near the end of the mass driver would make minute adjustments to the trajectory of the launched ore to ensure it reaches its target — a mass catcher at the Earth-moon Lagrange Point 2. "But I also believe that current efforts will be successful, and electromagnetic thrust will eventually be considered for other applications, including space," the official added.